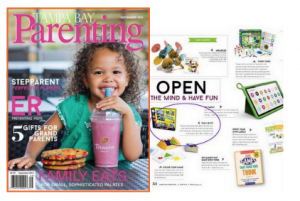 Congratulations to our Client Flip2BFit for their feature in Tampa Bay Parenting! Say so long to sedentary students and revolutionize the way children stay active in the classroom, gym class, recess or at home with Flip2BFitâ€”the first and only fitness board game that provides endless entertainment and lets players twist, jump and stretch their way to a healthier lifestyle! Playing Flip2BFit is easy! In approximately 30 minutes, players learn about nutrition, make healthy choices and perform various exercises featured on different playing cards. By the end of the game, they are sweating and moving to a great workout without even realizing it! Perfect for young students with energy to burn! Check them out at flip2bfit.com!